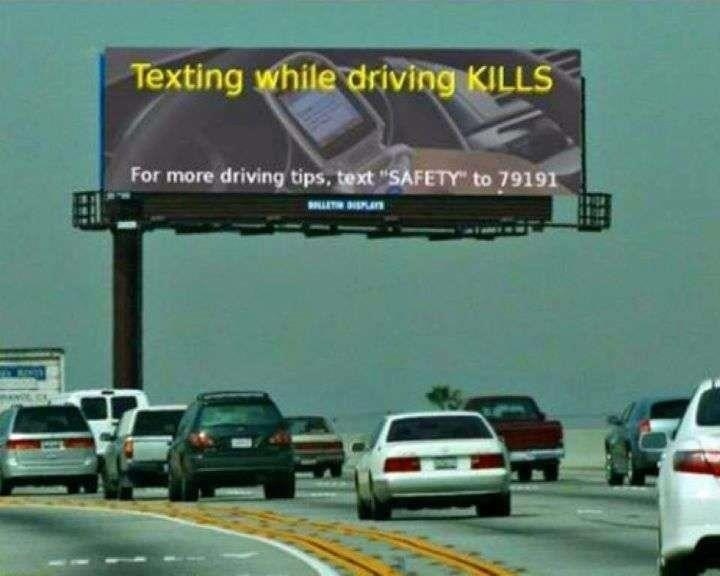 I guess if texting while driving kills……WHY anyone should text to the given number for more Safety Tips…one might be driving alone and cannot send text while driving…..I guess it does not make much of sense this way…. A Catch-22 if ever there was one. I learned somewhere that a billboard ad, to convey its message, should have no more than 5 words. A billboard is not the medium on which to put numbers—to text or call. The ad agency might have realized it was a bad idea—putting a # for folks to text on a billboard. But the client may have requested it. And you mention “regulatory authorities.” As long as the ad isn’t offensive, I don’t think authorities who regulate billboards care what info is given. This lame-brain ad has state or local government written all over it. Stupid is, well you see it right there on that sign not one single thing more needs to be said. In the UK NO billboards are allowed at all on the main motorways – this is so that there are no distractions to drivers. They are allowed here, but not encouraging people to text!